Tshering Sherpa does not have black money with him but has the life's savings of Rs 20,000 in old Rs 500 and Rs 1,000 notes. 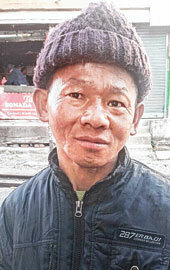 Tshering, who is known as Hawa (air) - this is one of the few words in his limited vocabulary - can neither speak properly nor hear, and ekes out a living doing odd jobs in Sonada, 17km from Darjeeling. The man in his mid-forties knows nothing about the demonetisation drive and cannot understand that his life's savings have turned worthless. After the Centre had withdrawn old Rs 1,000 and 500 notes, people were allowed to exchange those currencies till December 30. Now, only NRIs and those who were abroad during the two-month period can exchange the notes. Preeti Pakhring Lama, who teaches history at Holy Cross Higher Secondary School in Sonada, came to know about Tshering's saving and took to the social media to highlight his cause. "I request you all to help me, is there any way out? Can someone suggest how this issue can be resolved, so that we can find help from someone for Mr. Tshering," she wrote on Facebook. Lama told The Telgraph: "I am also from Sonada and two days back, I had gone to my uncle's grocery that is frequented by Tshering. There, I was told that he had some money with him. I tried to explain to him about demonetisation but he did not understand the issue. With hand gestures, I asked if I could count his money and he allowed me to do so." According to the teacher, Tshering has Rs 20,000 in Rs 500 notes and one Rs 1,000 note. He carries his saving with him.